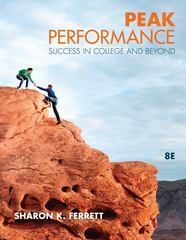 Peak Performance: Success in College and Beyond 8 Edition This best-selling text presents new and returning college students with practical, hands-on strategies for increasing their performance inside and outside the classroom. Peak Performance helps students make the connection between their academic efforts and their job and life skills. Students learn a variety of personal productivity skills related to positive work and study habits, as well as creative problem-solving, organizational, and interpersonal skills.This new edition includes new features to encourage students to practice their decision making skills and focus on one task at a time to achieve peak performance. This practical guide includes the most “how to” information to give students ample opportunity to put the material into practice.